The ICCIDD Global Network changes its name to Iodine Global Network. Iodization of salt to eliminate IDD is again confirmed by leading economists in the Copenhagen Consensus as one of the best investment strategies in international development. The ICCIDD Global Network is formed from consolidation of ICCIDD and the Network for Sustained Elimination of Iodine Deficiency, creating a powerful new alliance to assist countries in reaching the goal of sustained elimination of IDD. ICCIDD celebrates 25 years of work and creates Basil Hetzel International Award for Communications on iodine nutrition. ICCIDD leaders address the 9th International Salt Symposium which renewed commitments of private sector salt producers commitment to USI and IDD Elimination. ICCIDD leaders also assisted national scientific meeting of Government to confirm USI as strategy and formulate adjustments to accommodate successful progress. Iodization of salt to eliminate IDD is seen by the Copenhagen Consensus as one of the most economical efforts in international development. As an NGO in Consultative Status with the UN, ICCIDD leads the effort of the Global Network in a Special Event at UNGASS II called to review progress on children; 20 Member States attend at senior levels. ICCIDD attends and works with Delegations at The World Health Assembly which adopts Resolution 58.24 in May to require all Member States to report every three years on iodine nutrition status, the first ever. ICCIDD organized and led an international meeting of more than 20 health ministers in Beijing on the sustained elimination of IDD with reports from most Asian countries, plus Nigeria, Iran, Russia, Ecuador and Guatemala. UNGASS, the United Nations General Assembly Special Session on Children. ICCIDD attends in partnership with the UN University and helps to draft strongly endorsed commitment of Member States on USI as a strategy to eliminate IDD and endorses the goal of the Global Summit. The Network for the Sustained Elimination of Iodine Deficiency founded in Paris, France. Salt2000 the major gathering of industrialists in the salt trade endorses USI and IDD Elimination. The Global Network on Sustained Elimination of IDD was formed comprised of: ICCIDD, WHO, UNICEF, Salt Institute, EuSalt, Kiwanis International, Micronutrient Initiative, Emory University, US CDC. The National Advocacy Meeting in China organized with ICCIDD support launched the largest USI and IDD Elimination effort in the world with full endorsement of the Prime Minister in the Great Hall of the People. The 45th World Health Assembly and the WHO-FAO International Conference on Nutrition Commitment confirmed. Ending Hidden Hunger: A major policy conference on Micronutrient Malnutrition, takes place in Montreal, Canada. The 43rd World Health Assembly in Geneva recognizes IDD elimination as a major priority. The UN World Summit for Children, attended by 71 Heads of State and representatives of 15 governments, adopts a plan action that includes the virtual elimination of IDD by the year 2000. The United Nations Sub-Committee on Nutrition establishes an IDD Working Group to receive an Annual Report of Progress. With support from UNICEF, WHO & Australian government the ICCIDD is founded in order to bridge the gap between avail able knowledge and its application. 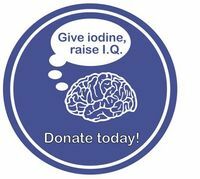 The concept of iodine deficiency disorders (IDD) is introduced with emphasis on the effects of iodine deficiency on brain function. The World Food Council is the first of a number of international organizations over the next decade to call for the elimination of goiter. The World Health Organization (WHO) presents the first comprehensive review of goiter on world scale, underlining the severity of the problem. However in spite of the successful elimination of IDD in a number of industrialized countries, only very slow progress is made in developing countries during the next 15 years.